As was noted here at the time, the BBC’s claim concerning Zouheir Bahloul’s resignation was premature and – as reported by the Times of Israel – the MK actually only stepped down on October 16th. “Zionist Union member Zouheir Bahloul formally resigned from the Knesset on Tuesday, some three months after he announced he would step down as an MK in protest of the recently passed nation-state bill, which he said officially discriminates against Israel’s Arab minority. Bahloul offered no further explanation after his Tuesday meeting with Edelstein. BBC audiences have not seen any reporting on Bahloul’s actual resignation. In late June we noted the appearance of an inaccurate and misleading map on the BBC News website. BBC Watch submitted a complaint on that issue and on July 30th we received a response informing us that more time would be needed to address the points raised. On August 18th we received a further communication informing us that the time frame for addressing the complaint had run out. 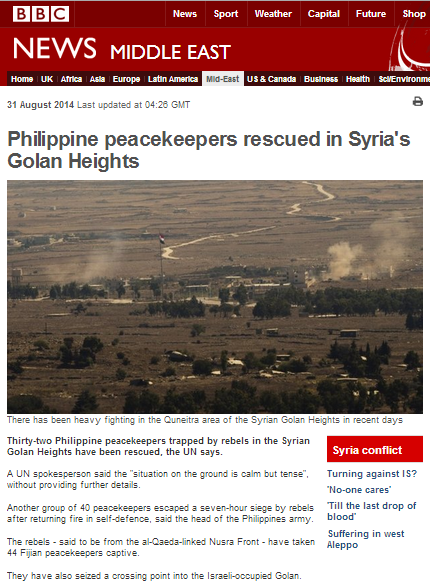 On October 15th the BBC News website published a report titled “Syria reopens key crossings with Jordan and Israel-occupied Golan” in which we discover that the BBC in fact knows that UNDOF was not in control of the DMZ when it published the map which led audiences to believe that was the case. “The Syrian national flag was also raised at the Quneitra crossing with the Israeli-occupied Golan Heights at a brief ceremony on Monday morning. In 2014, after 45 peacekeepers were held captive for several weeks by al-Qaeda-linked jihadists and their bases attacked, Undof withdrew to the Israeli side. Back in August 2017 we asked “Are BBC audiences getting the full picture on Syria’s chemical weapons?” and since then we have continued to document the corporation’s promotion of false balance when reporting on that subject. It is of course impossible to determine how many members of the BBC’s audience – who have previously seen countless promotions of unchallenged denials from the Syrian regime on this issue – will have come across this latest BBC report. On the afternoon of July 11th a Syrian drone infiltrated Israeli airspace. IDF Spokesman Brig.-Gen. Ronen Manelis said that the drone was spotted before it entered the demilitarized buffer zone between the two countries. “We spotted an unmanned aerial vehicle at around 3:20pm flying toward the buffer zone and we followed it. It was spotted before it crossed into the demilitarized zone,” he said. Several hours later, Israel responded with strikes on three Syrian military posts. 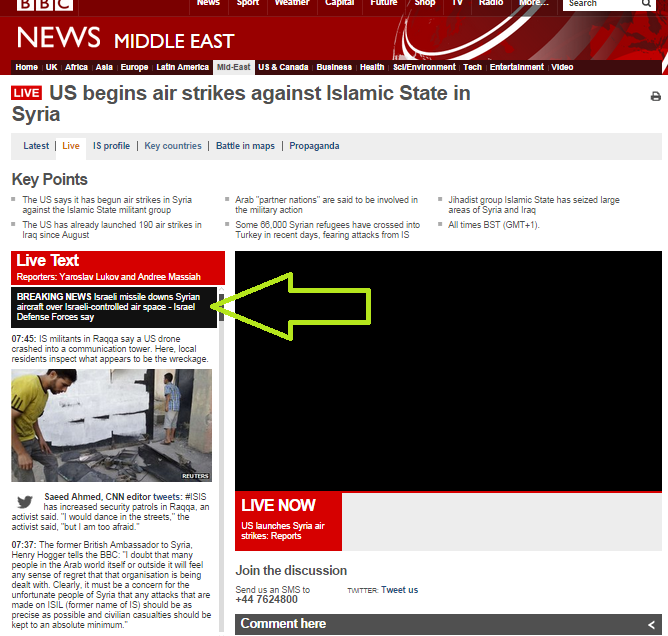 A BBC News website report titled “Syria war: Government attacks IS enclave in south-west” that was published some two and a half hours after the interception included a description of the incident in twenty-six words, none of which clarified that the drone had infiltrated 10 kms into Israel. 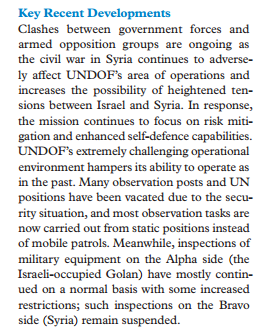 The relevant fact that UNDOF forces redeployed to the Israeli side of the buffer zone four years ago and no longer carry out their designated mission with regard to Syrian forces was not clarified. “Iran, Israel’s arch-enemy, has deployed hundreds of troops to Syria, ostensibly as advisers to the government. Thousands of Shia militiamen armed, trained and financed by Iran have also been battling rebels alongside the Syrian army. Apparently though the BBC is still quite happy for its audiences to go away with the impression that Iran’s military build-up in Syria is primarily an Israeli claim. 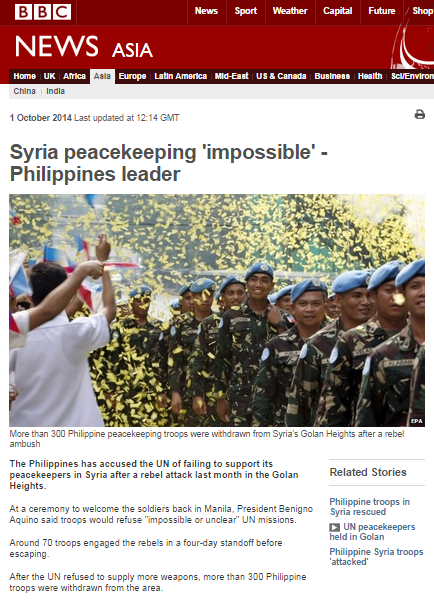 October 1st saw the appearance of a report titled “Syria peacekeeping ‘impossible’ – Philippines leader” on the BBC News website’s Asia and Middle East pages. The article relates to statements made by the President of the Philippines at a welcoming ceremony for his country’s soldiers formerly stationed with UNDOF in the Golan Heights. Since late August the BBC News website has produced numerous articles on the topic of the UNDOF mission – see here, here, here, here and here . This latest report brings the total number of articles on the subject published in the five weeks between August 28th and October 1st 2014 to nine. The two countries signed an armistice in 1974, after which the UN Disengagement Observer Force was put in place to monitor the demilitarised zone. As this latest report and a quotation in the BBC’s September 1st article both illustrate, countries contributing personnel to UNDOF are well aware of the fact that the situation on the ground has changed significantly in the past couple of years and the terms of 1974 armistice agreement cited by the BBC are no longer being upheld. Recent reports from the UN Secretary General and the Security Council both reflect the changes brought about by the fact that the UN’s presence failed to keep the DMZ demilitarized. The widely reported infiltration of a Syrian military aircraft into Israeli territory on September 23rd was only covered by the BBC News website in the form of a brief announcement on a live page being run that day on the subject of US airstrikes against ISIS. 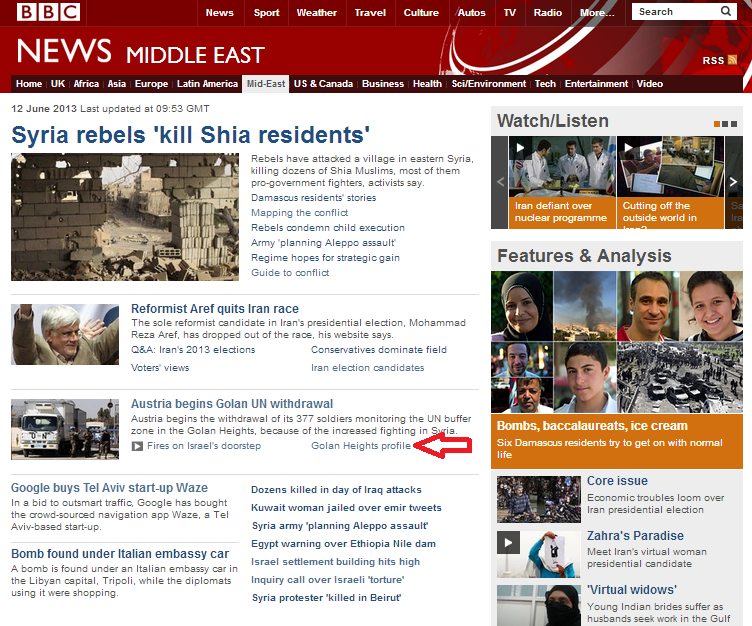 BBC audiences continue to remain in the dark with regard to the significant changes and developments in that particular part of the Middle East due to the fact that the corporation continues to use long redundant template descriptions of the region in its articles and its area profile, hence impeding audience understanding of current and future events. On the afternoon of March 18th Israeli soldiers patrolling the northern part of the border with Syria in the Golan Heights noticed something suspicious near the fence which marks the western (‘Alpha’) side of the demilitarised zone, adjacent to an area of the border currently controlled by the Syrian army. After they got out of their vehicle to investigate, an explosive device was detonated, injuring four soldiers: one lightly, two moderately and one very seriously. Israel responded with artillery fire towards Syrian army positions. 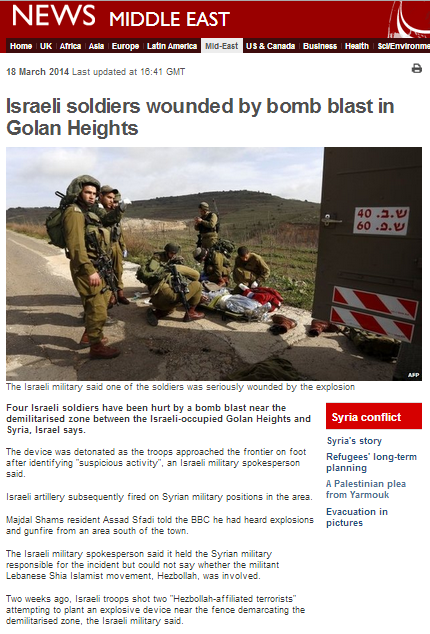 Several hours later a report appeared on the Middle East page of the BBC News website under the title “Israeli soldiers wounded by bomb blast in Golan Heights“. The incident itself is described in three short paragraphs phrased to suggest to readers that the information has not been confirmed by the BBC. “Four Israeli soldiers have been hurt by a bomb blast near the demilitarised zone between the Israeli-occupied Golan Heights and Syria, Israel says. The device was detonated as the troops approached the frontier on foot after identifying “suspicious activity”, an Israeli military spokesperson said. The only reference to the severity of the injuries sustained by the soldiers comes in the caption to the photograph chosen to illustrate the article. 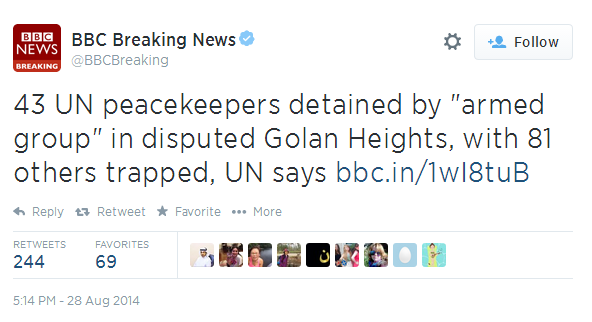 “The Israeli military said one of the soldiers was seriously wounded by the explosion”. The report goes on to mention (partially) two previous recent incidents among several ignored by the BBC at the time. “Two weeks ago, Israeli troops shot two “Hezbollah-affiliated terrorists” attempting to plant an explosive device near the fence demarcating the demilitarised zone, the Israeli military said. Israel seized the region from Syria in the closing stages of the 1967 Middle East War, and thwarted a Syrian attempt to retake it in 1973. The two countries remain technically in a state of war, and UN observers are deployed to monitor the 70km-long (44-mile) demilitarised zone. The report fails to make clear to readers that all of those “exchanges of fire” took place after cross-border attacks – intentional or not – from the Syrian side of the fence. It also fails to clarify sufficiently to readers that the presence of armed Syrian military forces inside the demilitarised zone contravenes the ceasefire agreement of 1974. 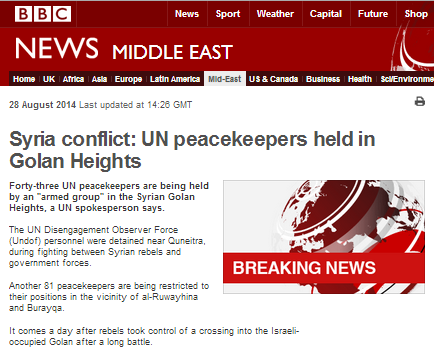 Additionally, BBC audiences are not informed that the demilitarised zone is now only partially monitored by UNDOF or that the routine weapons inspections that body is supposed to carry out (to ensure that both Israel and Syria adhere to the permitted quotas specified in the ceasefire agreement) are no longer being carried out by UNDOF on the Syrian side. “Israel says it has attacked several Syrian military sites in retaliation for a bombing that wounded four of its troops in the occupied Golan Heights. Readers of the report’s initial versions were not provided with any updated information regarding the wounded soldiers (one of whom, at the time of writing, remains in a critical condition) and most of the information given was recycled from the previous day’s report in the form of a link. In the report’s two earlier versions, once again audiences were encouraged to see prior cross-border incidents in terms of equivalence rather than them being accurately described as Israeli responses to attacks from the Syrian side. “The Israeli air force has conducted several attacks on Syria since the uprising began three years ago. Of course Israel has not given any official notification of having carried out those strikes, but yet again it appears that in this case – despite editorial guidelines on accuracy – the BBC is in no need of confirmation before turning its correspondents’ conjecture into ‘fact’. Once again, the BBC failed in all versions of this report to adequately clarify to audiences the current situation regarding the demilitarised zone, the decline in UNDOF supervision and the presence there of armed Syrian forces in violation of the ceasefire agreement. 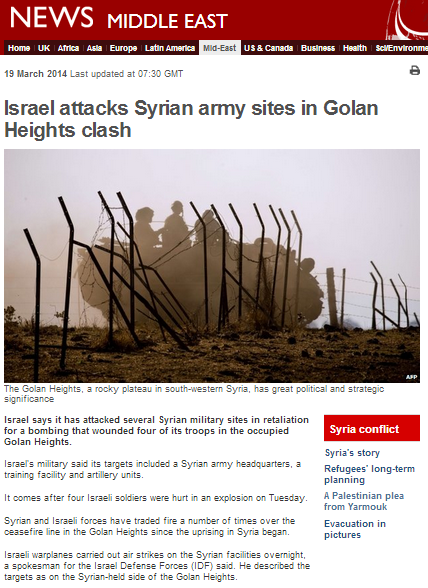 The article’s fourth version (which had its title changed to “Israeli air strikes in Golan ‘kill Syrian soldier'”) included Syrian state media notification of military casualties resulting from the Wednesday morning strike and uncritically quoted a bizarre official statement from a regime which has killed hundreds of thousands of its own citizens over the last three years. “But the Syrian General Command of the Army and Armed Forces was quoted as saying the air strikes were an attempt to “divert attention from the successive victories” of its troops against rebel forces, particularly the recapture of the town of Yabroud, north of Damascus, over the weekend. In fact, whilst it has yet to be established which organisation carried out the attack, the Israeli minister of defence made it clear that “Israel viewed Syrian President Bashar Assad as the person responsible for what happens in his country”. No attempt was made to provide BBC audiences with further background information on the topic of the different armed elements to be found on the Syrian side of the border. The article ends by again mentioning the previously unreported incidents of March 4th in which an attempt was made to plant an IED in the same area and last Friday’s attack at Har Dov. It is not made clear that Tuesday’s attack took place along a stretch of the frontier controlled by Assad’s forces, in contrast to much of the rest of the border which is held by opposition militias of one description or another. 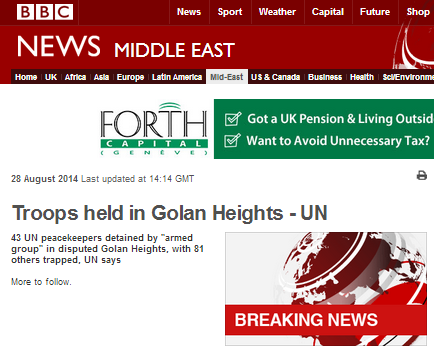 The BBC’s coverage of incidents in the Golan Heights over the past year or so has been patchy at best. Hence, with audiences already lacking much of the context to this latest incident, proper provision of factual information relevant to the story’s background would have enhanced readers’ understanding of events. Unfortunately however, the opportunity to inform audiences on the current state of affairs along the border and of the reasons for the growing ineffectiveness of the demilitarised zone in preventing attacks such as the one which took place on Tuesday – and any future ones – was passed up by the BBC. 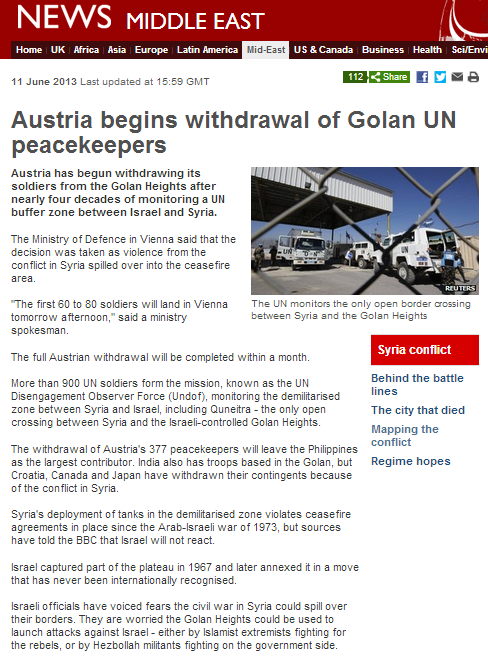 An article appearing on the Middle East page of the BBC News website on June 11th 2013 related to the withdrawal of Austrian members of UNDOF from the Golan Heights. 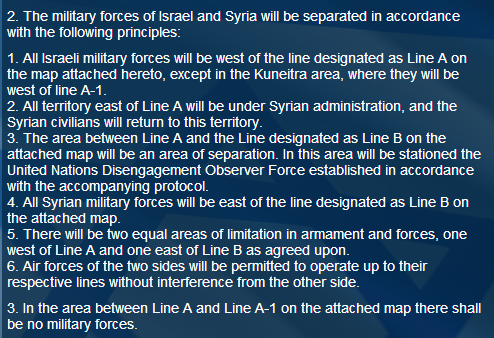 Quneitra cannot be accurately described as an “open crossing” as it is used on a regular basis only by members of UN forces and – with prior co-ordination and after the issue of the appropriate permits – by members of the Golan Druze community studying in Syria. It is also used on occasion by Druze from the Golan villages getting married in Syria or Syrian Druze getting married in the Golan, by Druze pilgrims to Syria and as a point of entry for the trade of apples grown in the Druze villages, with the coordination of the Red Cross. Tourists or civilians who do not belong to the Druze community cannot use the crossing. Whilst the Yom Kippur war certainly began in October 1973, the ceasefire agreements only came into being at the end of May 1974. 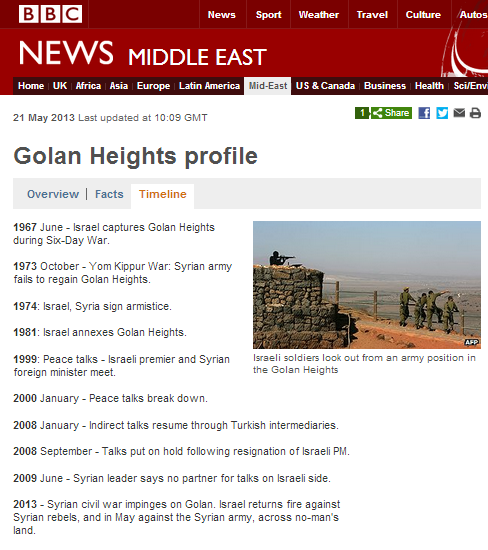 On the Middle East homepage, the article was presented together with two ‘related articles’, one of which is the BBC’s profile of the Golan Heights. We have already addressed the subject of inaccuracies in the “overview” section of that profile here, but in the “timeline” section we also find an inaccurately captioned photograph. 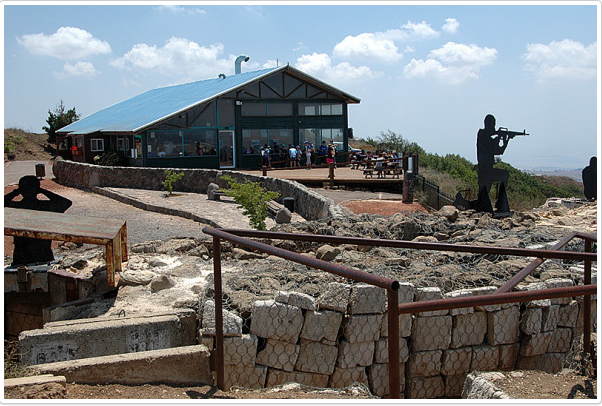 That photograph was in fact taken at Mount Bental, which is not “an army position” as claimed by the BBC, but a tourist attraction run by Kibbutz Merom Golan. The metal cut-out soldier on the left of the BBC’s picture can be seen in the photograph below from the opposite angle – with the site’s decidedly un-military coffee shop in the background.